On 24 and 25 December 2012, around 40 immigration detainees at Morton Hall Immigration Removal Centre (IRC) in Lincolnshire protested against their conditions and treatment. Their complaints and protest went unreported in the press until, on 2 January 2013, the Prison Officers Association (POA) claimed that on 30 December, when tensions were still high in the prison, a number of guards had been injured while trying to break up a fight between two groups of detainees, and that the POA feared for its members safety and lives. FRFI spoke to a detainee, who has been in Morton Hall for 28 months; he did not wish to be publicly identified for fear of reprisals, and who is referred to below as CF. He told us: ‘the BBC is always giving a platform to all the lies generated by the racist POA, but would never report anything we report to them. I have personally rung them every time assaults took place’. Detainees in Morton Hall say that the food is often bad and over Christmas was served cold, and money sent in does not reach them. Running up to the Christmas period staff turned off the detainees’ water supply as a punishment for two men having a fight over a game of pool. This meant prisoners were not able to flush the toilets in their rooms or take showers. Complaining about such treatment frequently leads to reprisals from the prison staff. CF told us that: ‘the regime in Morton Hall is too racist and people are being beaten up by guards every day for simple things such as asking where they are being transferred to. Sometimes the beatings can be six or more guards on one person and always happen in the cells where there is no CCTV.’ He said that on 28 December a 15-year-old Afghan boy held on suicide watch was bullied by guards in the corridor as he refused to go back to his cell, fearing that if he did he would be beaten by guards there out of the view of the prison CCTV. Unlike most IRCs, which are managed by private companies, Morton Hall is state-run and the guards belong to the POA. 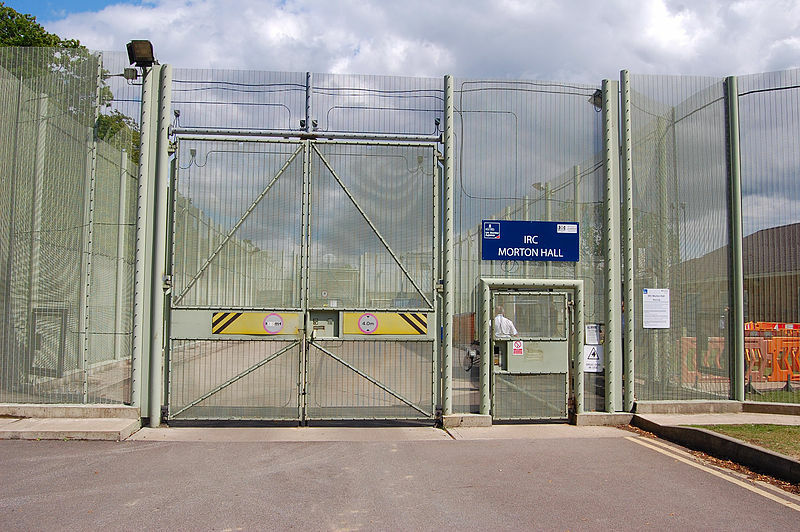 Detainees who have been in different IRCs report that the staff in Morton Hall are even more aggressive towards them than those in Brook House, Colnbrook and Harmondsworth IRCs. POA spokesman Glyn Travis emotively told the press: ‘We feel one of our people is going to get killed as staffing levels have been reduced...We will get a member of staff murdered on duty.’ However, CF told FRFI that only one guard was injured, and that this occurred when a detainee defended himself against guards who were assaulting him whilst he had his hands cuffed behind his back. His version of events is backed up by Rod Booth of the prison’s Independent Monitoring Board, who refuted the POA claims, telling the BBC on 4 January that he had viewed the CCTV of the incident and that Glyn Travis’ claims were exaggerated and inaccurate. Despite the detention itself being state run, the medical facilities at Morton Hall are outscourced to private firm G4S - the company which killed Jimmy Mubenga on BA flight 77 in 2010. G4S remain largely untrusted and although UKBA has ceased its deportation contract with them, replacing them with the firm Reliance, G4S continues to operate inside the immigration prison system. Very often, prisoners at IRCs like Morton Hall have committed no crime other than being an immigrant, holding the wrong paperwork, or not being able to prove their identity. It is not the screws of the POA or the ‘custody officers’ of private companies who live in constant fear of potentially deadly assault, but the detainees who must be defended from the very real threat of violent attack by prison guards.